Link load balancing (LLB) describes the process of sharing traffic originating from IP addresses, across multiple interfaces to increase available bandwidth, maximise throughput, and add redundancy. Note: This is separate from shaping traffic originating from applications. For a detailed description of how to shape traffic originating from applications, see About Bandwidth Shaping. The relevant license is required to install the Bandwidth module. For more information, refer to your Smoothwall representative.  Forwarded — For load balanced outgoing traffic.  Migrated primaries — For load balanced traffic, originating from the previous primary interface, or interfaces.  Web filter — For load balanced, proxied traffic. Note that this pool is only created if Guardian is installed. Predefined pools are configured to use the maximum available bandwidth for that interface. You can change this to suit your organizational needs. For a detailed description of how to do this, see Creating Load Balancing Pools . 2. From the Link Load Balancing pools table, highlight the relevant pool, and click Edit. 3. Edit the configuration as required. 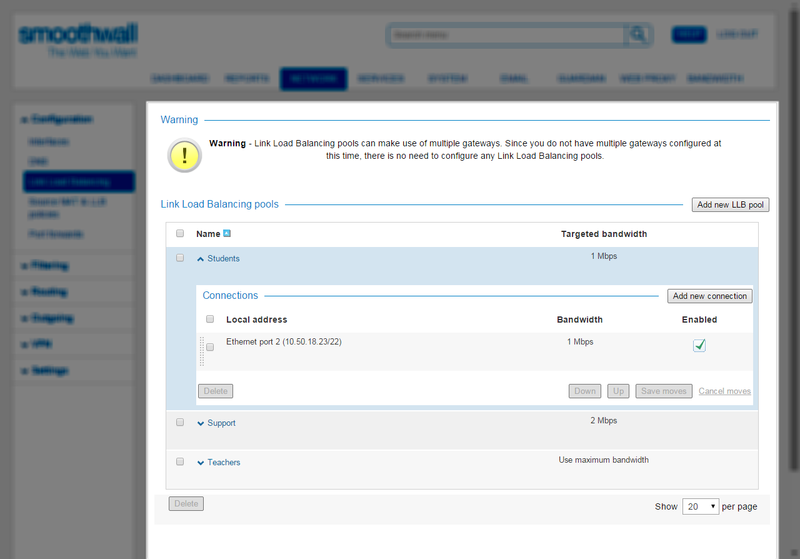 For a detailed description of each setting, see Creating Load Balancing Pools .  One third of traffic from the Research Office pool — weighting of 2:1 is still maintained for this pool even if other pools are using the same link as available bandwidth and link saturation are not measured.